Previously on Orange Is The New Black, Achilles Goss kept faith with his players. Better than Ole Gunnar Solskjær? "No" - the answer to the above question. In the last two editions of Football Manager I have posed similar questions to myself, comparing my exploits to the managerial feats of José Mourinho at Inter Milan & Osvaldo Zubeldía’s Estudiantes. I’m unsure if it’s a sign of regression, or the state of things here at FC Lorient…but my in-game persona, Achilles Goss, failed to beat Ole Gunnar Solskjær to the 2019/20 Ligue 1 Manager of The Year award. Despite a successful season, with Lorient retaining their place in France’s top tier and exceeding board & fan expectations: Solskjær won. A manager who improved Lille from 15th place to 6th and won nothing, hardly justifying the award is it? 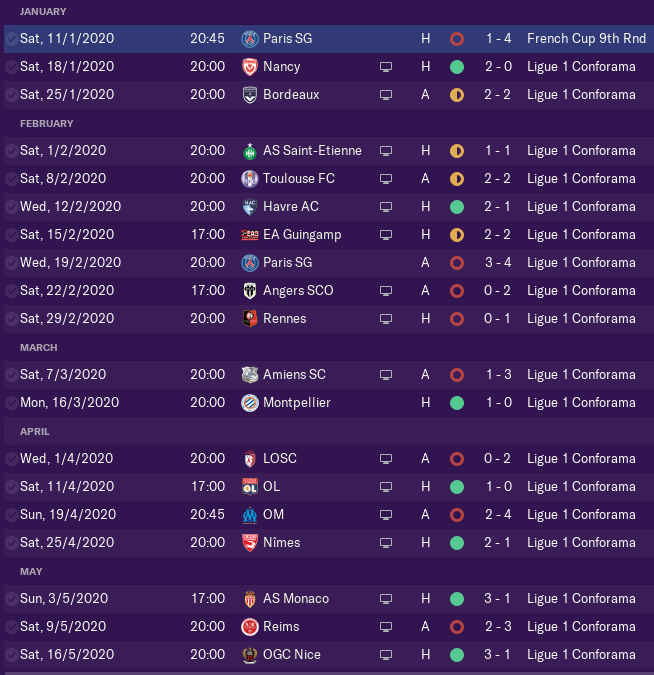 Never mind, my second season in Football Manager 2019 has been a blast. We stayed up and played some good football in the process…perhaps a little too brazen at times (going six months without an away win) but I’ve enjoyed it all the same. It’s even led me to reject the summer advances of En Avant Guingamp, Stuttgart & OL. I’ve decided to honour my Lorient contract…which means at least one more year here in the North West of France. It was an unspectacular 2nd half of the season, where we struggled for consistency. We won the last four remaining home games, whilst ending the season on a 6-match losing streak away from home. It painfully highlights that my tactic needs perfecting, which will be a central focus as I head into pre-season. But let's face it: a 7th placed finished has surpassed my initial expectations for the season, we were never in a relegation scrap as we pushed for Europe in the final weeks. The theme of 'Trust' from my previous blog post was undeniably rewarded as nine players from the previous Ligue 2 season started in our XI on the final day of the season (a 3-1 home win to relegate Nice). The climax to season 2. I am also happy with the output I am getting from my trio of attackers: IF-DLF-W. Central Striker Gaëtan Courtet equalling his league goal scoring tally for last season with 18 goals. Also, big outputs from Fonsinho 8 goals/10 assists and Cabot with a league topping 60 key passes for the season. I am also happy with Victorien Angban who made the central midfield slot his own as a Ball Winning Midfielder on support duty. Areas to strengthen are clearly at Right Back, as temporary solution Christophe Jallet retires after a year back at Lorient. Also, my loan players: Younousse Sankharé, Alexis Blin and Facundo Colidio depart meaning that vacancies need to be filled centrally in midfield and upfront. Now on to the subject matter of today’s title. As mentioned in the intro, our debt had progressively grown over the last 12 months. Despite 19 of our 20 home attendances of 2019/20 being full capacity crowds of 17,076 fans, it's still not enough revenue coming into the club when combined with the meagre TV money that French clubs receive. Achilles Goss' FC Lorient are in a Catch-22 right now: we need to invest in improvements to the team in order to stay competitive (thus becoming more commercially attractive for future investment), but also manage the debt sensibly. I'm accepting of the fact that I will need to sell in order to buy, it's actually proving a good challenge within the save. However, there was still one card up my sleeve yet to be played. Something I have been aware of since Day 1 of the save: the 20% of Dortmund's Raphaël Guerreiro's next transfer, who played for FC Lorient for 3 years during 2013-2016. To view Transfer Clauses, visit the 'Transfers' screen and head to 'Clauses'. You will notice the currency symbol where clauses can be 'bought out' or ‘cashed out’. This means your Board have negotiated with other clubs to end the arrangement and this works for both incoming and outgoing clauses. E.g. You may have signed a guy and agreed to pay the selling club X amount after 20 league goals. You can buy yourself out of this agreement for a lump sum, which will be cheaper than if you let the clause run its course. Age. Guerreiro is moving into his prime years. My observations lead me to believe that the clause's cash-out is dictated by how close a player is to his ability cap (CA/PA). Similarly, the value changing could be based around more factors than just age/ability, perhaps additional factors that influence transfer value…such as: remaining contract length & wage. Time in the season. The value increased over the two years in the approach to every transfer window. In fact, sometimes the clause was not even available to sell. Leading me to think that the Board negotiated different deals each time on the lead up to windows. Interested clubs. Another factor that seemed to boost the cash-out value was the number of clubs interested in a permanent transfer. At the end of January 2019 (when still in Ligue 2), Guerreiro's cash-out value was around €7.8m due to the European Heavyweights of Barcelona, Man City, & PSG all being interested in him. At the time, I let this run the full course of the January Transfer Window (it rose from €5.65m to €7.8m in this month alone) and missed out on the highest cash-out option offered to me over the 2 years of observation. So, I've decided to finally cash-out at €6.7m in June 2020, a million euros less than 18 months ago. Why? Because I simply need the money right now. I couldn't work on €106k with a key player retiring and 3 players loans expiring, Season 3 would have been more challenging than Season 2! It was simply time to exercise Guerreiro's gift. I’m not frustrated by the outcome either, this particular clause on FM has been enjoyable to see play out and perhaps somebody, somewhere, can take note and use it to cash-out at the optimum moment. With the Guerreiro money and €3.5m sponsorship arriving to see us out of the red, I’ve been able to invest in a permanent Right Back. Darko Todorovic arriving with a deal rising to €2.5m. Darko moved from RB Salzburg to RB Leipzig in-game last season for €6.5m, so signing him for circa 60% less a year later is good value. I have my new 2020 scouting team to thank, as I wanted to move quick in the transfer market by using the short-term focus option in the scouting screen. The team is now led by Gérard Bonneau, who is a great target for any scouting team (see below). Underneath him I have recruited Pierre Aubame as an African scout, together I hope they can prompt me to look at some fine talent. In advanced of the move to bring in Darko Todorovic, I had arranged pre-contract deals with two young midfielders, who I hope can fill the void in central midfield: Agustín Palavecino & Luca Valzania. I see Palavecino as a Deep Lying Playmaker and Valzania as a more Box-to-Box type of player in my 4141, but both free signings are still a bit risky. Palavecino has never played in a top-flight match (as he hails from the Primera B Nacional in Argentina) and Luca Valzania has only made a few cameo appearances for Atalanta in Serie A.
There’s around €200k left in the transfer budget for the back-up Striker. I could also explore the loan market and see if I can find value there or sell to buy. But the gift of Raphaël Guerreiro has certainly helped me out in this save, merci mon ami. As always, to find out what happens next on OITNB follow me on Twitter (@FM_Grasshopper), on FM Slack (#fmgrasshopper)…or on here for the next post.